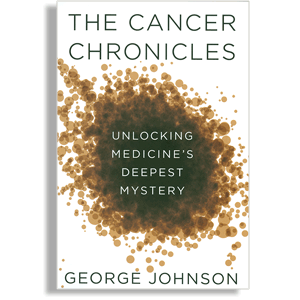 Johnson does not start his exploration of cancer today, as one might expect, at the moment of diagnosis. Rather, he begins at the beginning: with a trip to desolate Western Colorado, to the site that yielded the oldest known case of cancer, in a dinosaur commonly called brontosaurus. The Apatosaurus died without the benefit of chemotherapy 150 million years ago, and likely not from cancer. That discussion of the cell gone bad drives Johnson through cell theory, mutations and self-restraint. I was more interested in his treatment of the environmental “causes” of cancer. Twenty-five years ago, explorations of large “cancer clusters” at Love Canal or Toms River suggested that humans were self-poisoning with the very chemicals that undergird economic progress. No longer; Johnson tours some of the studies that have debunked the link to chemical exposures (smoking excepted) and cancer. Although ionizing radiation can unquestionably cause cancer, Johnson lifts rocks to deliver another surprise. The awful explosions at the Chernobyl nuclear plant, for example, were not followed by the expected wave of cancer; the latest calculations project a 1 percent increase in the rate among the 600,000 people with the highest exposure. What’s left is a metabolic link between obesity and cancer, the idea that fat cells trigger inflammation and a cascade of bad things. It’s too early to know if this is the cause de jour, or a realistic explanation.